Giannis Antetokounmpo leads Milwaukee to Game 4 win over Boston. MILWAUKEE (AP) — After seeing a 20-point second half lead slip away, Giannis Antetokounmpo came up with a huge play in the final seconds to save the Milwaukee Bucks from a devastating loss. 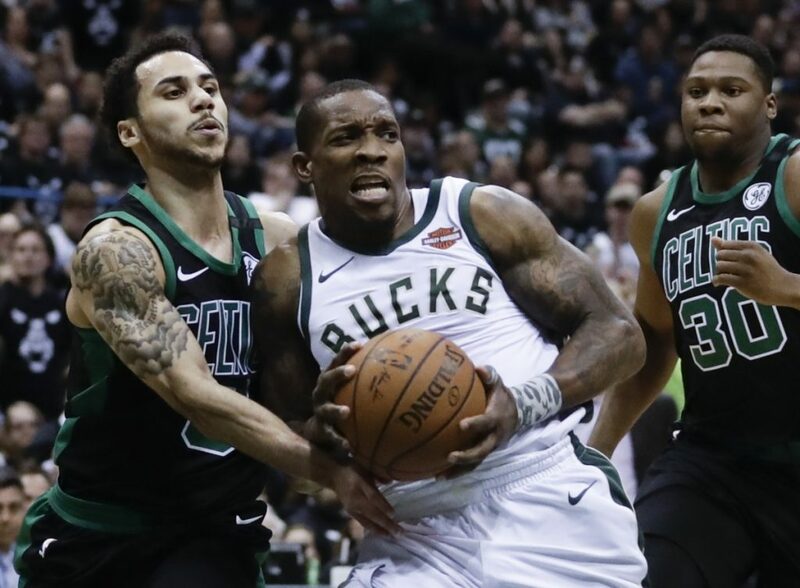 Eric Bledsoe passed the ball right from the perimeter on Milwaukee’s final possession. Antetokounmpo moved down low to the left side of the basket and Malcolm Brogdon came across the lane for a driving hook shot in traffic that hit the rim. The 6-foot-11 Antetokounmpo was in perfect position to reach over Boston’s Jayson Tatum to tip in the miss for the go-ahead basket with 5 seconds left for a 104-102 win on Sunday over the Boston Celtics. Their first-round playoff series is tied at two games apiece. “It’s a heck of play,” coach Joe Prunty said. Antetokounmpo finished with 27 points, while Khris Middleton added 23. Middleton also played in-your-face defense in the final seconds on Marcus Morris, forcing the Boston forward to miss a 14-footer at the buzzer. The Bucks’ two best players made the crucial plays to hold on for a tense win victory, another sign of maturity for the one of the league’s up-and-coming teams. “One of the most important things that we can carry from this game moving forward is that we stayed disciplined and we trusted one another,” Antetokounmpo said. The disappointing end for the Celtics overshadowed their spirited rally from a 65-45 deficit with 7:37 left in the third quarter. Play got chippy and the Celtics limited the Bucks’ transition game. Antetokounmpo “made a great tip-in and he was battling for the ball. That’s what great players do,” coach Brad Stevens said. “We played great in the second half. We played great in the first six minutes of the game. The 18 minutes that ended the first half were not good. They had a lot to do with that.” – Stevens. “Thon is playing extremely assertive. The blocked shots are going to stand out because that’s something somebody can see on the stat sheet,” Prunty said.